Years back when my youngest brother Neil lived here and I played music a lot louder than I do today, he perfected a good vocal impression of the 90â€™s improv that poured out of my room. His high speed, jerky, staccato approximation managed to sum up the music really well in a few seconds. Back then it used to annoy me slightly that Neil, without trying too hard was able to recognise enough common traits in the music of SME, Bailey etc, to be able to distil them into one brief lo-fi comedy soundbite. It meant that much of this music that I considered to be so free from rules and formulas actually sounded the same to an outsider. Its probably inevitable that any area of music that establishes itself over a period of time will begin to develop its own definable characteristics. 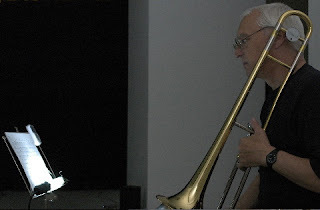 When the first inklings of what has become known as EAI began to develop it sounded fresh against the backdrop of the improvised music that had preceded it. This new strand of improvisation continues to evolve and develop, branching off into several new directions over recent years, but at the same time there has formed a widely perceived idea of common characteristics, sounds and structures that inhabit the musicâ€™s middleground. It wouldnâ€™t surprise me that if Neil was living here today he wouldnâ€™t have too much of a problem impersonating EAI as he had done before with other music. I should be clear at this point that at its fringes the music continues to explore new territory, and at its heart if familiar properties have developed in the music then they are characteristics I like a lot. As the music has gotten older it has increased in quantity and the cream of the music has improved a great deal in quality. The inevitable bi-product of the development of settled forms of playing in an avant garde area though is the emergence of music that either completely ignores the established mannerisms or addresses them directly as part of the music. Maybe its just become a subconscious preoccupation of mine, but Iâ€™ve listened to a number of CDs over the last twelve months or so that seem to attempt the latter. Something I have come to question is whether there is any link between them. One name behind a good number of these releases is Radu Malfatti. His bleak, featureless composition based more on the ticking of a stopwatch than the passion and immediacy of improvisation came as a response to the â€œtalkativeâ€ qualities of contemporary music. The twelve CDRs Malfatti released on his B-boim label challenged the listener to maintain their attention by removing many of the common elements of music, such as progression, event etc. This resulted in music that forced the listener to think differently about what they expected from a CD. Long, grey, featureless sounds stopped and started abruptly, nothing faded in or out. Seemingly overlong silences sat between them leading the listener to wonder if they were hearing the same sound over and over or were there subtle changes. The music then became a test of memory as much as it was an enjoyable listen. Despite appearing on three or four CDs that have proved to be important to the development of EAI (Polwechsel 1, Beinhaltung and Futatsu spring to mind) Malfatti has never really been considered to be part of any EAI â€œsceneâ€, and his composition of recent years has come as a response to the traditional formulas of all music, not just one small section. His impact on a younger generation of musicians though is evident. Mattin, Taku Unami and Taku Sugimoto are three musicians that have all worked quite a bit with Malfatti that have in recent years made music that challenges the listenerâ€™s perception of how their music should sound. I wrote a while back here about Mattin and Unamiâ€™s 5 Modules III collaboration with Korean musicians Ryu Hankil and Jin Sangtae, a confusing, awkward disc that utilises deliberately ugly sounds combined with sharp changes in volume and abrupt shifts in dynamic. With that recording its as if the primary focus of the music is to remain one step away from any kind of listener comfort, but not via the extreme volumes that Mattin has worked with before. With 5 Modules III Unami has reassembled the music made by the quartet in such a manner that the CD rejects any kind of flow. Many of the characteristics we have come to expect from EAI are subverted, sounds appear out of nowhere before the music is ready for them, either disappearing abruptly or outstaying their welcome. The last third of the CD sounds nothing like the first, using sounds that jar our conditioned sensibilities of what should be heard on a CD. This all keeps the listener from settling into the music at all, and instead keeps prodding them, asking for extra attention. Taku Unami has since released two solo discs. 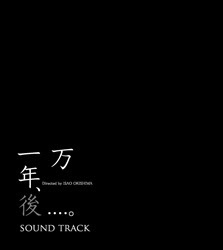 The first, the soundtrack to Ichimannen, goâ€¦ a film by Isao Okishima goes even further again, mixing short blasts of static with extended silences, more unfashionable synth sounds and a series of field recordings that veer wildly between obscure Eastern marching music to an Albinoni piece for violin and ghostly Christmas Carol-like singing. Once again as listeners we are left confused, this time by the combination of the abstract and the semi-familiar placed together with seemingly no obvious connection. On the Soundtrack disc it is unclear how much the construction of the piece is due to the music complimenting the film. This certainly wouldnâ€™t be the first film soundtrack to sound extremely odd once separated from the associated images. The other recent Unami release though, the three part composition Malignitat on the Skiti label also seems to utilise this concept of sounds transposed from their more familiar habitat but then uses them in a manner we are less familiar with. The first piece on the album, lasting like its two companions exactly fifteen minutes appears to be a composed piece realised on a computer. The form and structure of Malignitat I is somewhat austere, made up of two samples, played at differing pitches, one an extended sound, the other very brief. The short samples are scattered throughout the piece acting as tiny moments of counterpoint to the extended bursts, but with lengthy silences remaining present in the music, broken up here and there by false starting samples jabbing into the space as if triggered by accident. The composition in itself is interesting enough. It could be seen as a natural continuation of Malfattiâ€™s work, though the addition of the second, shorter bursts of sound bring considerably more complication to the music than Malfatti usually settles upon. Where this music takes a conceptual leap away from anything we have heard recently however is through the content of the samples themselves. Where we might expect a droning cello, a sinewave or a passage of digital static the extended sounds on Malignitat I are sourced from a single sample of a helicopter. Although slowed down here and there the sample is always obviously a helicopter, it isnâ€™t disguised or used ironically. The first â€œinstrumentâ€ on the disc is simply a sample of a helicopter. The other sound we hear often is an electronic â€œbloopingâ€ sound that wouldnâ€™t sound out of place in a 1980â€™s video arcade game. These short Pong-like jabs seem almost randomly sprayed into the spaces at the beginning and end of the helicopter samples, and occasionally randomly into the long silences, but above all they sound alien and somewhat unmusical. The samples are also stopped and started abruptly. The helicopter suddenly bursts into the silence and is then cut off brutally every time. There are no subtle fades to bring polish to the music. In fact if the music can be summed up in one sentence it could be that it perseveres to avoid the subtleties, expectations and craftsmanship of much contemporary new music. Malignitat I is in itself an invigorating composition, but it is the use of the non-musical sounds that add a further dimension to the music. I find myself asking the question â€œwould I feel differently about this music if the helicopter part was taken by a sinewave and the Pong sounds a guitar?â€ Unami seems to ask a very simple question with Malignitat I; Why are certain sounds considered musical and â€œacceptableâ€ within an EAI setting and others not? Why are field recordings OK if they are blended into music but not when they are treated as an instrument themselves? The second piece on the Malignitat disc utilizes the more familiar sound of Unamiâ€™s contra-guitar from the beginning. His playing is oddly stuttering, almost robotic at times, again sounding like the mechanics of the stopwatch lead the way over the human input we are used to hearing from a guitarist. For the most part Malignitat II is made up of entirely guitar parts, sometimes multitracked so that two sections layer over each other, but the listener is left continually alert because of the music that came earlier on the CD. Sure enough the helicopter suddenly reappears late in the piece, duetting this time with the stuttering guitar notes. On several levels Malignitat seems to exist purely to play with the accepted ideas of how a piece of contemporary music should sound. I like this CD a lot, but its very hard to explain why. Its not something that could be described as beautiful, or even particularly nice to listen to. Its difficult to applaud any craftsmanship involved as Iâ€™m not certain that a large part of the composition isnâ€™t completely random. I like this music simply because it makes me think. It has already been criticized because it apparently ignores the listener, perhaps looking down upon them from arty heights. This is completely wide of the mark in my opinion. Without the direct involvement of the listener trying to decode Malignitat there is little here. Unami involves the listener centrally within this music. For me it exists as an awkward partnership between artist and audience, incomplete without the tension between them. Malignitat will annoy those that are averse to anything conceptual and those that fear anything that challenges the sacred rules of improvisation. Unami and Mattinâ€™s recent work has been dismissed as a second hand take on the Fluxus movement, but this comparison is also wide of the mark. This is not abstraction for the sake of it, rather a well thought through investigation of the form and structure of contemporary music and the listenerâ€™s response to its subversion. Taku Sugimotoâ€™s new album Doremilogy, not surprisingly also on the Skiti label captures three versions of a composed piece that proves to be as much of a musical enigma as Malignitat. This album furthers Sugimotoâ€™s composed work of recent years into even more perplexing territory. As the title suggests the simplicity of the major scale lies at the heart of the composition, which is presented here in solo guitar form alongside two different versions for three multitracked guitars all played by Sugimoto. The first of the three tracks begins with one continuous, twenty-one minute long sustained note obtained by holding an E-bow against a single string. The sound wavers slightly, reminding us that this music is being played live, but essentially all we get is one long held note. After twenty-one minutes Sugimoto suddenly brings the E-bow up through the strings to step the note up through the major scale. This last rising segment lasts just twenty seconds. The second piece again plays with the simplicity of the rising scale, this time utilizing a more familiar Sugimoto technique of individual notes dropped into wide silences, though he does stop and run through most of the scale quite rapidly (by his standards!) at one point. The final piece returns to the extended E-bow notes, I think utilising the notes of the scale again, only slower and this time moving from high to low. Back in the summer I witnessed Sugimoto play this piece live as part of a septet and again it stood out amongst the programme of pieces played that evening as being somewhat simplistic and downright perplexing. Aside from the resonance of using such a fundamental element of Western music to construct this composition, the music again sets out to challenge the listenerâ€™s perception of what to expect from modern composition. Even amongst a live programme that included typically austere compositions by Radu Malfatti and others Doremilogy stood out as awkwardly oblique. As with the 5 Modules III release and Malignitat this CD seems to exist as much to make the listener stop and think about what forms music should arrive in as it does to present us with something to listen to. I find myself thinking of a couple of critical visual art works of the 20th Century in relation to these discs. Duchampâ€™s urinal is obviously a good marker, a work that shocked and upset its viewers as it asked questions about what art should consist of. As a sidenote Unamiâ€™s helicopter could be considered a â€œready madeâ€ in the manner of Duchamp, unadorned, unaltered, merely placed in position for consideration by its audience. This isnâ€™t quite true as the helicopter sounds are used as just one part of a carefully constructed work, but the similarities are food for thought. Magritteâ€™s Treachery of Images (This is not a pipe) springs to mind for some reason also, not for its surrealist considerations, but more for the confusion caused when the listener gets something other than they expected when playing one of these CDs. This is composed, recorded and released music, but then it isnâ€™t, or at least not as we are used to hearing it. I also wrote recently here about Antoine Beugerâ€™s Silent harmonies in discrete continuity, another CD that seems to address related concerns. Beuger is a member of the Wandelweiser collective, related again to Malfatti and also an influence on the two Takus. 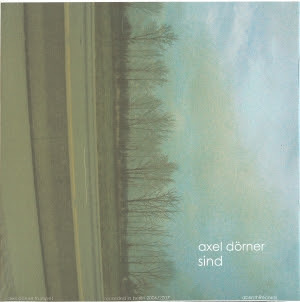 One other disc that might connect to this (quite possibly non-existent) trend of anti-music is Sind the recent solo disc by Berlin trumpeter and EAI mainstay Axel DÃ¶rner. On the surface Sind does indeed seem to investigate similar ground to Malfattiâ€™s compositions as many short tracks consisting of minimal material are placed together with occasional lengthy silences between them. Its more probable that DÃ¶rnerâ€™s approach developed completely independently of the other releases mentioned here, there is nothing to suggest that there is any direct connection to them. There are many similarities however. Listening to Sind is a difficult experience. The fragments of sound vary quite a lot in their form but somehow all retain an ascetic feel, small blocks of industrial waste carefully positioned with assorted silences placed here and there between them. Sind is beautifully structured, the piece reminds me of walking through an abstract expressionist collection in a gallery, different colours and textures playing off each other in small episodic moments, some closer together than others. Whilst Sind may not be as willfully disarming as some of the other releases I have mentioned here it does utilise a structure that departs from any familiar forms we might expect from an EAI release, suggesting that perhaps the need to force new ways of both making and listening to this music could become more widespread than just a few linked names. To finish I should make it clear that I am not advocating this kind of approach to music composition above any other. I have here merely tried to draw lines around what appear to be vaguely related releases to try and understand any common links between them. I will say that I find this questioning, challenging approach to making music a very healthy thing for EAI in general. Whilst there is plenty of room for many strands of the music to co-exist this dramatically conceptual direction can only serve to pose questions to other musicians that can either be considered or ignored. That a number of individuals are prepared to challenge any sense of status quo can only be a good thing for the continued vitality of this area of music. I look forward to being further confused in the near future. Hmm well, I think I understand what you’re getting at with all the zooming, but the fact is that after paying only a passing attention my brother could impersonate the improv I was playing back then in such a manner that although he copied no one musician/Cd in particular it was clearly free improv he was impersonating. I understand what you say when you point out that some musicians will sound quite different every time and others less so, and I agree. I was making a generalisation though that showed that at the heart of an area of music a set of formulas seems to form, whilst at the fringes it may remain relatively fresh. Thanks anyway. Do you have a name? !